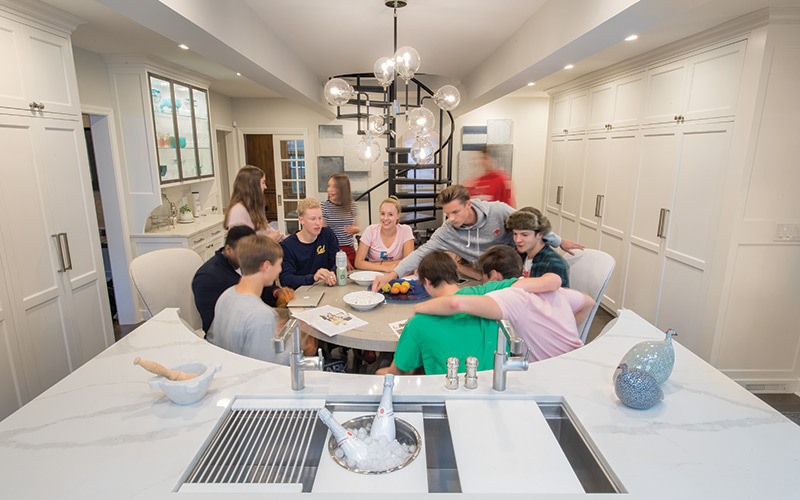 A renovated garden-to-table kitchen, and lots of teenagers, are the beating heart of this great Shaker home. On this gloomy fall day, the Geiers’ roomy white kitchen is cozy and bright. Homeowners Peter and Emily brew fresh coffee and chat comfortably with Dan Stafford, the Woodworks Design project manager who practically lived in their home during the Geiers’ total kitchen renovation last winter and spring. After a moment, Dawn Cook, the kitchen’s designer, enters through the back door to a chorus of happy greetings. 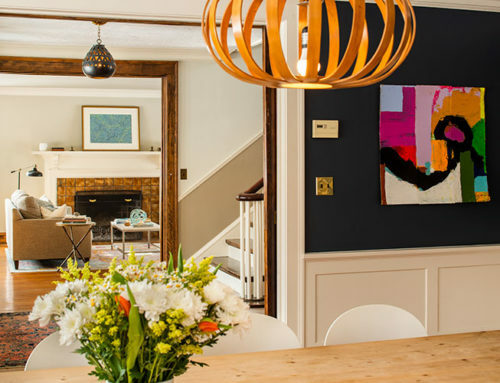 The Geiers, Woodworks Design, and Dawn Cook Design managed to pull off the seemingly impossible: a home renovation that was at once amicable, professional, and on schedule. No wonder everyone is so pleased to be reunited. Perhaps the spirit of camaraderie is fed by the kitchen itself. 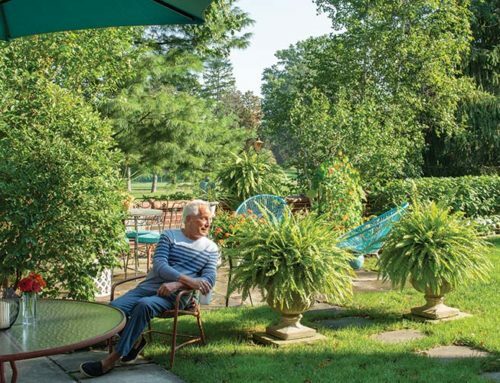 It’s the kind of place – both before and after renovation – where people come together. On the day I visited, I had just missed the eight teenagers who had popped over from Shaker High to eat lunch. This isn’t unusual for the Geiers. The handsome colonial on Ashford Road just around the bend from the school is, with the Geiers’ encouragement, a magnet for teens. In the spring, 3-on-3 pickup basketball games brought 15 boys at a time to the house five days a week, Emily reports with pleasure. How many kids of their own do they have? “Two going on 22,” quips project manager Dan, who clearly enjoyed the steady stream of adolescents in the house that didn’t let up even during the renovation he supervised. Yes, the Geiers have just two “official” children, Wilder and Grace, who are, respectively, a senior and freshman at the High School. For the school year, they also have Finnish exchange student Aksel who is following his older brother as a long-term guest of the Geiers. In addition, there are the friends who seem to be family – the kids who are so welcome and ever-present that their snack preferences are permanent fixtures on the Geier grocery list. 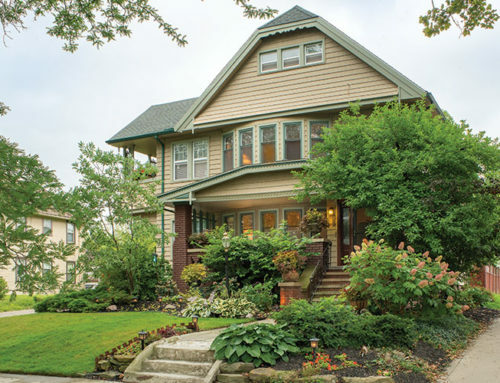 When Emily, Peter, and newborn Wilder moved into their home in 2000, the kitchen was already spacious, thanks to a substantial 1991 renovation by the previous owners. That earlier renovation had knocked out walls to combine a narrow back hall, a small breakfast nook, and a small kitchen, and bumped out the rear exterior wall several feet. 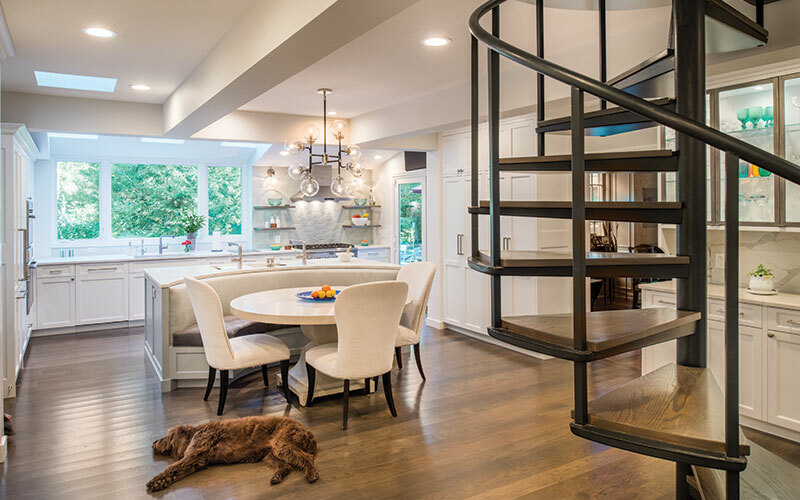 To top it off , a striking metal and wood spiral staircase was added to anchor the kitchen and provide quick access to the upper level. But the kitchen was showing its age, and Emily and Peter began to think about updates. They knew what they didn’t like – ailing appliances, an uneven, hard-to-clean terracotta floor, fluorescent lights, and dated oak cabinets. But they also wanted to keep and improve on the things they loved, beginning with that spiral staircase. It was never a question that the staircase would stay. The Geiers, including the kids, all insisted on it. “Most of their lives they’ve come sliding down that banister,” says Peter. They got no argument from designer Dawn, who also considers the stairs the centerpiece of the kitchen. There were other must-haves. Emily loved their round kitchen table, and definitely wanted to incorporate one into the new kitchen. 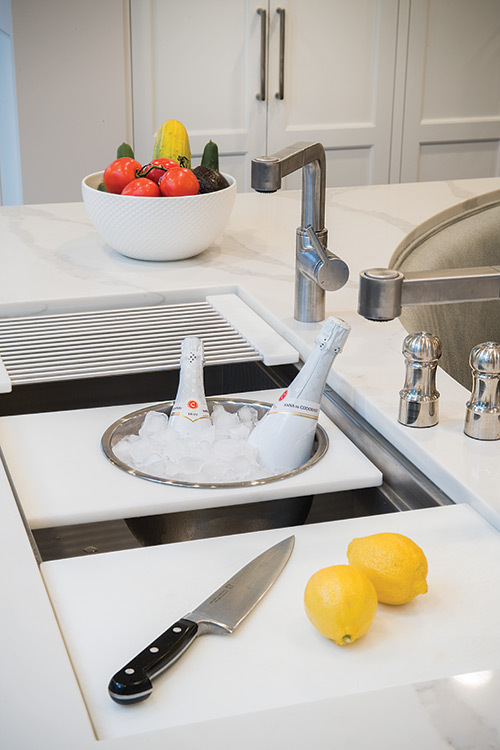 Peter and Emily had explored the idea of renovation for years, and an early inspiration-seeking trip to a Chagrin Falls kitchen showroom – well before they’d hired anyone – yielded a one-of-a-kind sink that the Geiers knew they wanted. The extra-wide stainless steel undermount sink with two faucets is a cook’s dream. Peter and Emily didn’t realize it when they hired Dawn, but she and Woodworks had already collaborated on previous projects, and were eager to do so again. Everyone agrees that the team approach made everyone’s work, and the final kitchen, even better. Emily nods in agreement. 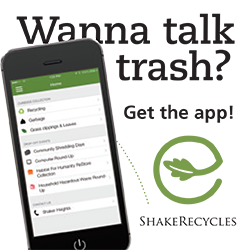 “Organically, these ideas would come up and you’d shift. 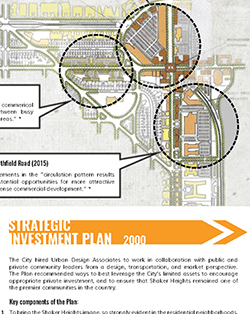 You’d think you wanted one thing and essentially you’d get that – but even better.” The demolition began last January. Gone was the dark tile floor, and gone were the massive glass window and skylight panels whose greenhouse-like effect had overheated the old cooking area on warm days. Gone were the old cabinets, the stovetop that didn’t quite work anymore, and the harsh lighting. 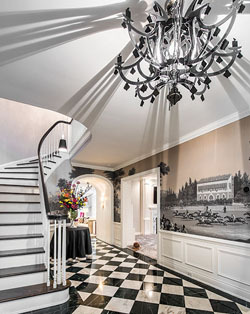 In their place, a collaborative design envisioned by the Geiers, Dawn, and Woodworks rose from the ground up. 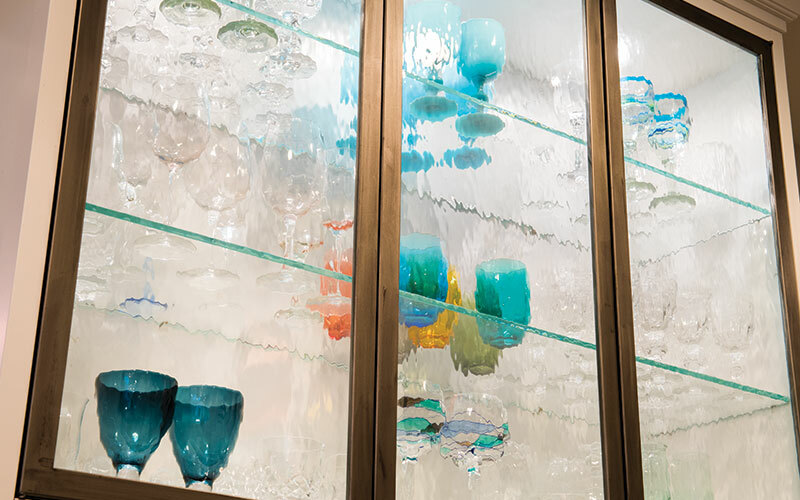 Custom hand-blown sconces crafted by Cleveland Art bathe the kitchen in light when the sun does not cooperate. Cheerful white cabinetry, custom-built at Woodworks’ Middlefield shop, wraps around the kitchen’s perimeter. Under Dawn’s advice, drawers and cabinets were placed where they’d be most helpful for cooking and baking, and a new mudroom bank of cabinets and drawers was built to disguise the shoes and coats that were formerly stowed in the open. Doors now also hide away the utility sink, where avid gardener and cook Peter might wash fresh backyard produce, or his golf clubs, as the moment requires. Everyone contributed to the design. 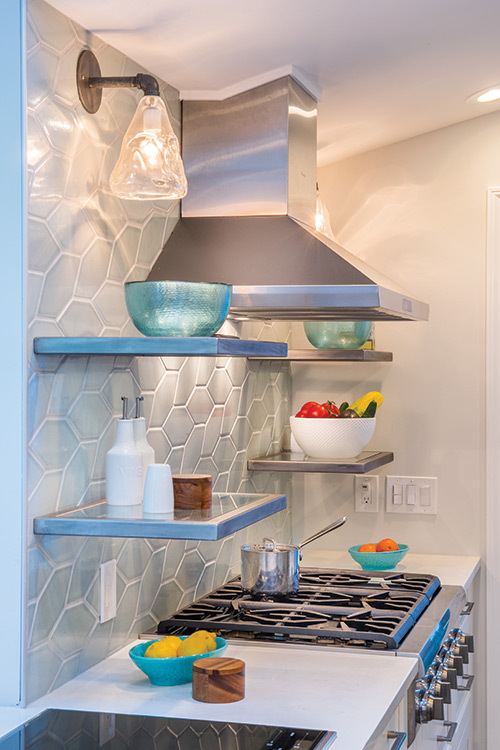 Emily found the pale-blue leaf tile that serves as a stovetop backsplash, and the built-in bar with lovely glass-paneled doors was her idea. Peter spotted the moody gray and blue art, whose circles and lines – as Dawn points out – echo the treads and helix shape of the spiral stairs. For the adjoining first-floor bath, which was also renovated at the same time, Dawn located vintage Indian shutters at a Larchmere Boulevard shop, and Woodworks turned them into cabinets. Everywhere, there’s the stamp of artistic inspiration paired with collaboration. Similarly, the team brought new life to a small paneled office next to the kitchen. 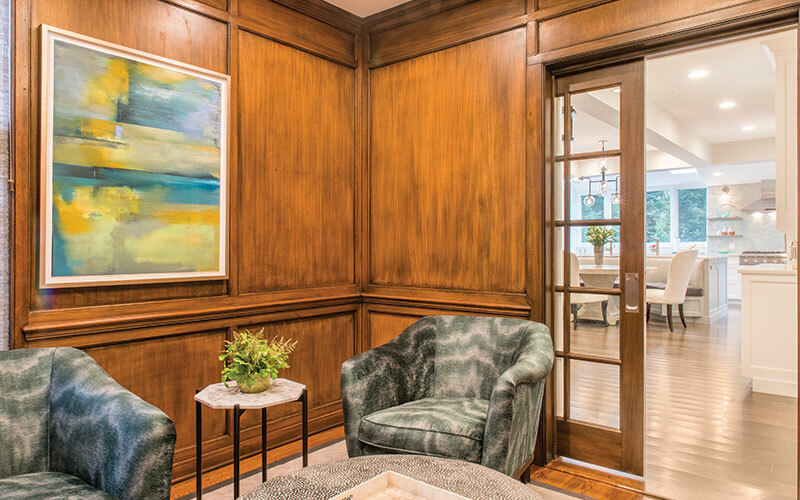 Formerly presenting a blank solid wall to the kitchen, Woodworks cut an opening and installed a sleek glass-paned pocket door that manages to perfectly mesh with both the clean white lines of the kitchen and the warm wood of the library. Dawn recommended the lighting. Now the Geier kids can do homework in the space within sight but apart from the bustle of the kitchen. Usually, though, everyone wants to be in the kitchen, probably seated at the inviting circular table that anchors the space. Perhaps the signature elements of the redesign are the table and the crescent-shaped banquette built into the kitchen’s island. 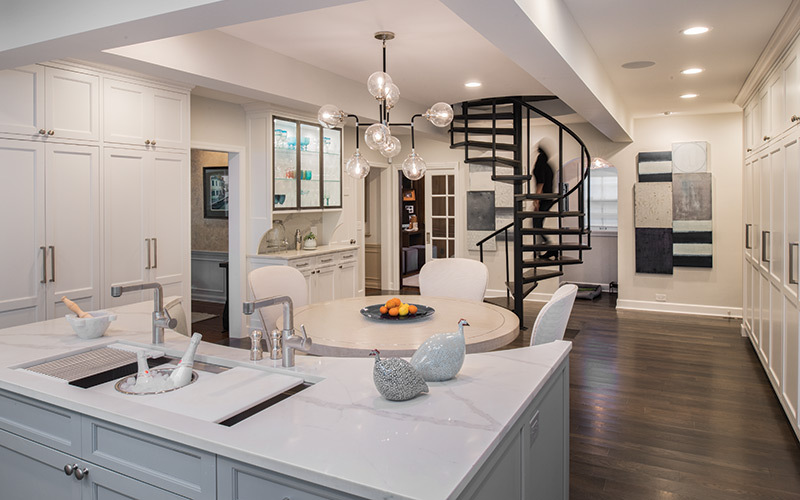 Emily knew for sure that the island, which was in the kitchen to begin with but which needed to be rebuilt to allow proper flow as well as installation of new fixtures, should unite the kitchen, not chop it in two. “I didn’t want an island where people sat on stools facing in one direction. We’d always had a round kitchen table. You’re looking at each other.” Instead, Dawn suggested the curved banquette. Not only would it physically and visually unite the preparation and dining areas, it would allow more people to gather around the table. The Geiers were sold. It was never a question that the staircase would stay. The Geiers, including the kids, all insisted on it. “Most of their lives they’ve come sliding down that banister,” says Peter. Apparently, the neighborhood teens agree, and that’s just how the Geiers like it. 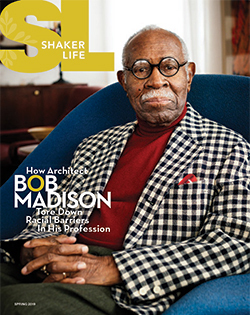 This article originally appeared in Shaker Life, Winter 2018.